Not much feedback (yet? ), but I am continuing with this idea regardless. Below you see the concept, a regular piece and a king (dividing the 32 identifying chips of Certabo into 24 regular pieces and 10 kings, to avoid having to stack the regular pieces). 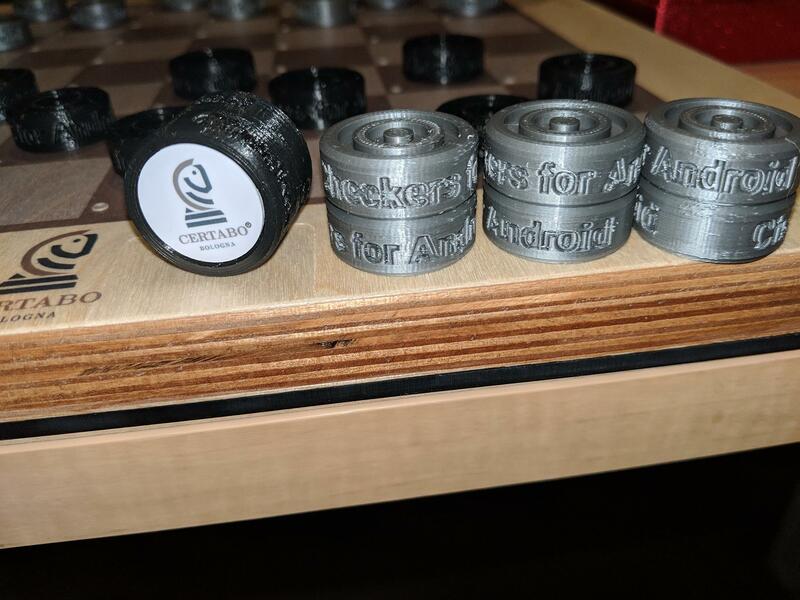 Courtesy my brother-in-law for the 3D printed checkers pieces. I got my new set of identifying chips from Certabo. 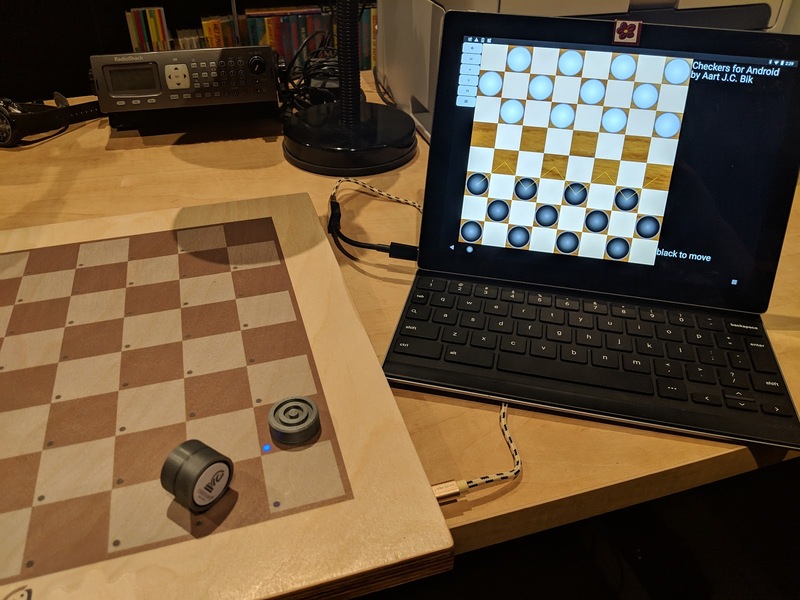 Together with custom-made checker pieces (courtesy Gerard Harbers) , Checkers for Android is ready to play! It looks really awesome, but why isn't stacking the pieces a viable solution? Yes, Checkers for Android could easily identify the chip of the piece that promotes as a king and play from there. 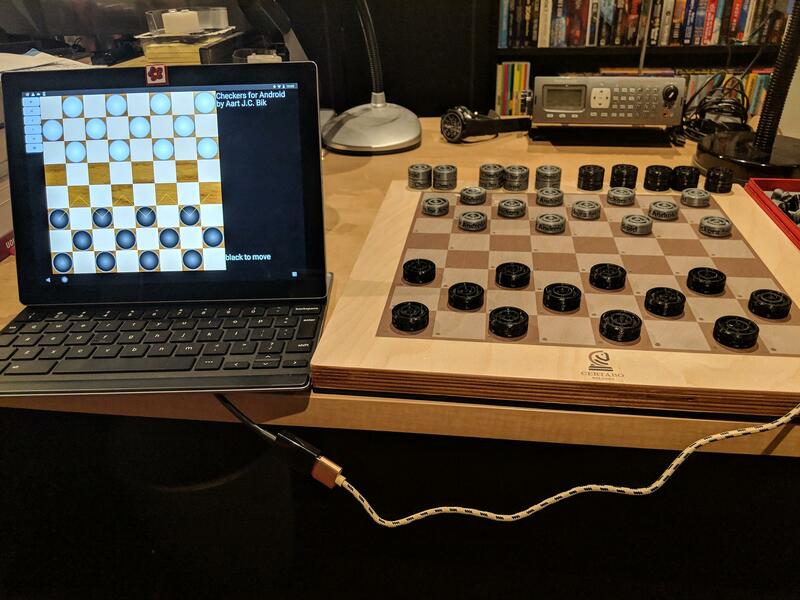 The human players probably want to mark that piece also somehow for their own recognition (and stacking would work, since the "bottom" chip is identified by the board). This would have been my solution if you had to pay for each Certabo identifying chip individually. But since they ship in sets of 34, I thought this would be the most fun solution. I have a question because I'm very interested in it. Is using a board " Electronic checker boards (over bluetooth) " to run a Russian draugths tournament in flying draughts. I would like to buy this board, but I must know that it will meet my expectations. I would really like to see an actual audience for this idea. A few things to consider though. Thank you for your response AartBik. - the board connects over USB, not bluetooth (if that matters to you) - even for me it's better that by USB. I would like to test, but unfortunately I can not. I do not have Android. Please, do it on Windows 10 64 bit. Please, do it on Windows 10 64 bit. Ai, I am terribly sorry, but this is really an Android only project for me. You may want to ask on the Certabo Forum if there are any plans to support checkers with a Windows application.